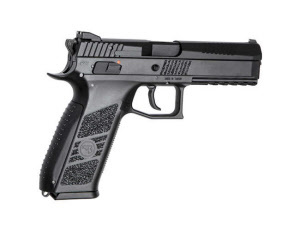 This is a 1-1 size Airsoft pistol with rail for attachments. Made under license from CZ and made from the original blue prints and gives a realistic look and feel.It has a great blow back system giving a strong recoil adding to the realism. This Airsoft gun has a plastic slide which is more efficient and is suited for cold weather. The Airsoft player will really like the smooth trigger pull with a 3-dot sight system that gives easy line up giving this package is superb Airsoft gun that can be used for all types of Airsoft games. Comes in solid carry case with cut out foam inlay with space for additional mags It can be used with gas or co2 magazines. WE Samurai Edge M9 airsoft pistol. This is a GBB (Gas blow back). Realistic feel with the Blow Back.